There is a paper cut out from Worcester News at the forlorn but aesthetically pleasing press box at New Road which reminds everyone of the rampaging floods which hit Worcester last year. Groundsman Tim Packwood hasn’t been forced to perform his pre-season rituals this time around. Nature has been kinder with no such melodies with water. But the pleasantries end there. Another year in the top echelon of English County Cricket and another bid to establish Pears at the top awaits. 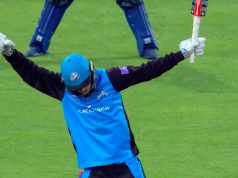 Worcestershire have been see-sawing between the two divisions for quite some time now and the topmost task for the players now is to challenge themselves to be at their best every time – that’s the best way of grounding out the necessary victims to stay in the division. Predictors have already given the pink-slip to the Pears’ chances of staying up, but there’s an air of romanticism about Worcestershire cricket, far away from the big city life, which mimics the charm and optimistic life the cathedral city of Worcester gladdens. Even in alphabetical order Worcestershire finds itself close to the bottom, an example of the county staying away from attention. While last season portrayed a one-man show which enabled the promotion by outsiders, it obscures the efforts of other players who showed up at different times to turn matches around. Take the case of Richard Oliver. In last May, he was captaining Shropshire in the Minor Counties Championship and thinking of a coaching career when then Worcestershire opener Matt Pardoe’s drop in form coincided with Oliver getting a phone call. Oliver took the opportunity and started bashing runs at the top. The seal of the promotion was architected by Jack Shantry against Surrey scoring a remarkable hundred and taking 10 wickets in one of the most complete displays of all-round talent seen on the county circuit. Tom Fell was in blistering form at the final few months with his century against Glamorgan coming the day after the death of his mentor, Damian D’Oliviera. There were players who stood up and finally made that collective leap towards justifying the faith set in them by Director of Cricket, Steve Rhodes. This will be another year of their ascension towards the ‘top’ bracket and there’s no better litmus test than Division One cricket. 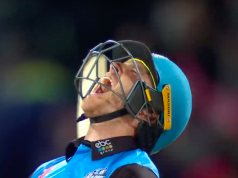 Worcestershire reached the quarter-finals of the Natwest T20 Blast but failed to reach the knockout stage of the Royal London One-Day Cup last year. While they stress they want to go as far they can in the shorter formats, the marked target lies in the LV Championship. Rhodes wants stability at the top Division, and what better year than this year, to lay a foundation to it, where Worcestershire Cricket Club celebrates its 150th anniversary. Ins: Alex Gidman (Gloucestershire), Alex Hepburn, Joe Clarke, Ed Barnard, George Rhodes, Graeme Whiles (all youth). Outs: Nick Harrison, Matthew Pardoe, Graeme Cessford (all released). Although Alex Gidman has been roped into add a seasoned tint, Worcestershire captain Daryl Mitchell remains the pivot at the top of the order. His runs will be crucial to elevate a batting line-up of relative inexperience and to lift them towards totals of substance. Mitchell passed 1000 runs for the season last year, which set the tone for their promotion. He showed the kind of form which England need, having tried and failed with lot of opening batters. He’s led the Pears since 2011 and has struck a nice balance in guiding the youngsters who have come through the process. A cool head under adversity, Mitchell has Worcestershire ingrained to him and the County requires him to flourish in its 150th year. Steve Rhodes called him well beyond his age when it comes to temperament and discipline; Charlie Morris’s greatest attributes are his unwavering accuracy and willingness to learn. 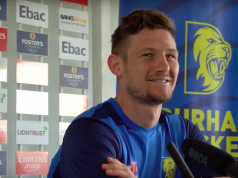 50 first-class wickets in his first full season speaks for itself and it was fascinating to see Morris expand his skill set from a line-and length bowler to a wicket-taking threat as the season wore on. His progression was striking and according to him, he’s been working on adding a yard of pace during the winter. Morris is well liked in the dressing room for his ability to listen and improve and if Worcestershire are to survive the drop, his wickets are of paramount importance. Saeed Ajmal’s love for the quieter surroundings of Worcester is conspicuous by the fact that he will again be returning to New Road. He took 63 wickets at 16.47 in nine matches which launched his county to promotion and having overcome being banned from bowling for an illegal action last year, Steve Rhodes stuck by him even when there was uncertainty over his future. He will see this as an opportunity to prove himself with his remodeled action. Ajmal won’t be available for the first part of the season due to international commitments though and for Worcestershire this will be a major blow as he can be destructive before batsmen get their eye into the season. That is if their punt at replacing Ajmal goes wrong. The punt happens to be another bowler who had to remodel his action recently and hasn’t got enough games under his belt after getting himself cleared to bowl again. Sachithra Senanayake was an unused member of the Sri Lanka World Cup squad, and equally someone who has a magnificent first-class record like Ajmal. Senanayake hasn’t been able to expand it to international level as much he would have liked it to, his collection includes a solitary test match and 45 ODIs, but he’s renowned for his accuracy and variation. Senanayake, 30, has 376 first-class wickets and according to Rhodes was one of the key contenders to replace Ajmal when they got to know he won’t be featuring in the first half of the campaign, thus gesturing towards it wasn’t a decision that was out of the blue as outsiders thought. Colin Munro’s destructive fare was in full display during the Natwest T20 Blast last year and Worcestershire was quick to resign him, the promptness evident from the fact that the New Zealander was the first overseas signing of the season. New Road officials rate him very highly and his skill to clear the boundary effortlessly. Munro struck 332 runs at a strike rate of 141 to go with seven wickets during Rapids’s road to the quarter finals of Natwest T20 Blast and having been out of national contention for over a year now, this is an ideal platform to wake up the selectors again. Pears are everyone’s number one pick to go down this year as they were barely in the reckoning to be in Division One this time last year. They have lot of odds to beat but if last year’s results proved, Worcestershire have a set of players who are beginning to take responsibility for their own performances. The strength of last year was the home form so making them tough to beat at New Road will be the key. Mid-table will be a great achievement in the LV Championship and on the limited-overs front, they would at least want to make one semi-final but that seems far away now. They can be the spellbinders once more if they are to defy the odds again.